OTTAWA – Bill Nye the Science Guy challenged Prime Minister Justin Trudeau in front of a university crowd Tuesday, over his approval of the Kinder Morgan pipeline and Canada’s reliance on fossil fuels. "I've gotten a lot of messages from my colleagues in the environmental community, and I have been to Fort McMurray, Alberta, it really is an amazing place in the most troubling way," Nye started. "But this pipeline Morgan Kinder [sic.]" said Nye. At this point Trudeau interjects, corrects him, and Nye continues: "If you don’t mind, tell my colleagues in the States, tell us about the Kinder Morgan pipeline." Nye—an American science enthusiast who used to host a PBS children’s show-- then directed the audience to check out The Solutions Project, which advocates for a 100 per cent transition to clean energy and includes research that argues Canada could in time be solely powered by renewable energy sources. "In the Prairie provinces there is so much wind, even here on a day like this there is so much solar energy, that if you could capture it and solve the storage and transmission problems, you could run the whole place. Nevertheless, there’s this enormous fossil fuel industry... so tell us about that," Nye asks Trudeau. Trudeau responds by first agreeing that there is "tremendous potential" for renewable energy, but that "we're not going to get there tomorrow, so we are going to have a transition phase," to develop alternatives to fossil fuels. The prime minister continues, spending several minutes explaining and defending his government’s environmental and natural resource policies. "There are people who love the fact that we have a national price on carbon, but really wish we weren’t approving the Kinder Morgan pipeline. 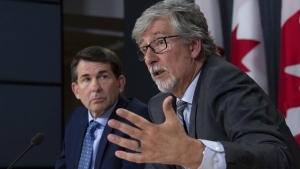 There are other people, many of them in Alberta, and on the other side of the political spectrum from me who really like the idea that we’re building that pipeline, but really hate the idea that we’re bringing in a national price on carbon," said Trudeau. The Kinder Morgan Trans Mountain expansion between Edmonton, Alta. and Burnaby, B.C. has been the source of recent acrimony between the two provinces the proposed line would span. British Columbia strongly opposes the project, while Alberta argues it is in the national interest. Trudeau has also fielded a number of questions on it during his latest round of town halls across Canada. "We have to make responsible choices that is [sic.] going to move us in the direction of getting off of our massive dependence on fossil fuels, to be able to do more renewables," Trudeau said. 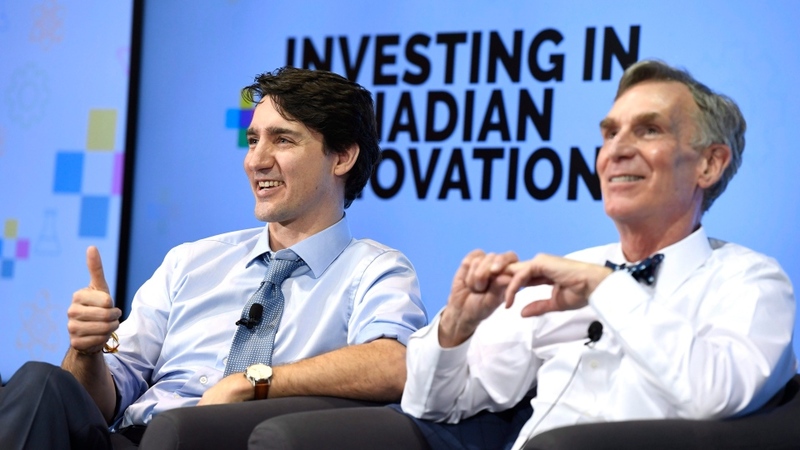 The exchange came at the end of an event at the University of Ottawa where the pair discussed science and innovation, and Trudeau promoted the 2018 budget. The Prime Minister’s Office told CTV News that the government approached Nye to host the event but that they are not covering any of his expenses.